Nothing strange there, says I. Apparently she has been reading Róisín Ingle in the Irish Times. “I have never read such a load of self obsessed, boring, self indulgent tripe in my life” says Herself. “I mean, who wants to read chicklet sh*t like that” [Herself was really worked up] “She is worse than Cecelia Ahern”. “You get your arse in gear and go out there and write a much more interesting article, Grandad. You never know, you might get her job and the world will be a better place”. For those of you who are not familiar with Róisín, she is a journalist who has built quite a reputation on the blogosphere. I found one mention of her in Skin Flicks. I’m sure there are a lot more. “But I wouldn’t know what to write about” I stutter. “I bet they’re not half as rude as the things people say about Róisín Ingle” says Herself. She probably has a point there. She has a nasty habit of winning every argument anyway. I feel sorry for Róisín. I don’t know what she did to deserve this. I don’t read her myself. I prefer Brendan McWilliams and his Weather Eye. I’m sorry Róisín, but She Who Must Be Obeyed has spoken. So I suppose I’d better toddle off now and see if I can find something more interesting than Róisín Ingle’s eyes to write about. A daily account of the growth of a tomato plant? Ten different ways to wash your car? The fascinating sport of watching paint dry? Your article still doesn’t explain who Roisin Ingle is. I’ve never heard of her before, but JC Skinner sure hates her. I’m guessing, though, that she is a being of unspeakable evil, as a lot of people seem to want rid of her. And what’s this blogspot in the Irish Times? I’m an Indo man, so I never see it. Herself says that if you don’t know who she is, then you are better off. 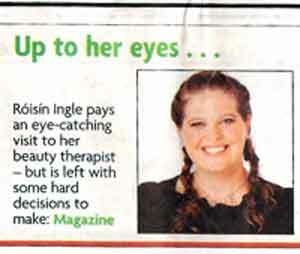 She [Roisin] writes a ‘fluffy’ page [a sort of printed blog] each week in the Irish Times Saturday Magazine. There used to be a very good ‘take-off’ blog called Roisin Bungle, but it has been removed for some reason. At the other end of the magazine [as far as you can get from Roisin] there is another new feature called Blogging On, where they quote from random blogs. Whatever catches their eye, I suppose. They took a piece out of this blog last week. Well done. At least you can say to Herself that you were as far removed from Roisin Ingle as possible. She certainly looks like a being of unspeakable evil anyway. I’d say that ‘unspeakable evil’ is a bit strong. She’s harmless enough. I don’t usually read her, but I read yesterdays offering and it is a bit on the naff side. More to the point, I think Herself is more miffed at the fact that I have now twice been ‘published’ in the Irish Times, and she hasn’t. I pointed out that she hadn’t written anything, but she said that was beside the point. she’s fluff but very readable. i’d like to see her put her attention to something more substantial, because she’s a good writer. they just give her humiliating topics. or maybe she picks ’em herself. I have a sneaking suspicion she picks ’em herself. Can you imagine an editor giving the assignment – “I want you to go out now and buy some eye make-up, and then write about it”? um….actually, yes. i once had to write a story for a newspaper about how i might look with a different hairstyle. definitely not my idea. the paper ran five pictures of me with various computer-generated hairstyles. and to make matters worse, my mother called me up and said she most liked the smooth blond ‘do. and it’s her damn fault i have uncontrollably wiry curls! God help you, Laurie. If I was you, I would have told that editor where to stick that article. Then I would have signed on the dole queue, because people don’t take criticism coming from me for some reason. Well done, Grandad, on being published twice in the Times. If people paid that much attention to my blog I’d be a happy man. Frankly Dario, I’m amazed at the attention this blog gets. This isn’t false modesty – it’s the real thing. I honestly didn’t think anyone would read it, when I started it. I only did it as an experiment. I suppose it still is an experiment. After all, it’s only just over three months old. I am sincerely baffled. ?????? Oy!! I started before you and I used the word ‘catharsis’ first. It’s mine. Leave it alone. If you don’t believe me, look at my “About” page. Your people shall be hearing from my people. Sorry, the settlement cheque’s in the post. I actually haven’t read that yet, I found the word in an article about the Smashing Pumpkins’ Billy Corgan – who uses his music the same way we use blogs – and thought it would be a nice addition to my vocab. Waddya mean – you haven’t read that yet? I put a lot of sweat into my writing, and then people don’t read it. I know how Roisin Ingle feels now. Yes. €10,000 will do nicely thanks. I love your wife. Can I marry her when she’s done with you, Grandad? I can tell already we’ve got a lot in common. No problem at all. Four or five times a day she tells me she’s had enough of me, but she changes her mind shortly after. So, if you time it right………..? Sounds like you’ve got under her skin. Dammit! Another good woman slipped through my fingers!